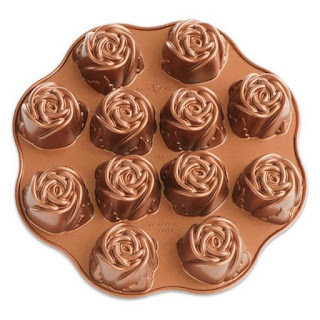 What better time to use a rose muffin pan than for Valentine's Day. I made my Valentine some mini rose bundt cakes, filled with fudge, because Valentine's Day must involve chocolate. To make the cake red, I colored the batter with beets, grated raw and then blended on high speed with water. When they had cooled, I used an apple corer to make a hole in the bottom that I filled with fudge sauce. I put a small piece of the cake back on the bottom to hold the fudge in. I cut one open so you could see what it looks like on the inside. Lightly grease and flour a rose bundt pan. Add the grated beets to 1 cup of the water in a blender and process until it turns to juice. Add more water to make 1 3/4 cups. In a mixing bowl, whisk together the sugar, oil, applesauce, vinegar, vanilla and cornstarch for about two minutes. Slowly whisk the beet juice into the sugar mixture. Whisk the flour mixture into the liquid mixture until it’s well combined. Pour the batter into the prepared pan, filling only 3/4 full. Cool for 10 minutes in the pan and then remove the roses. Remove the center of the muffin with an apple corer, being careful not to break through the top of the rose. Reserve a small piece of the cake that you removed to plug the hole.